Letter from another victim of restorative justice. - White Girl Bleed a Lot, Knockout Game, black on white crime. Letter from another victim of restorative justice. (“This is what restorative justice looks like…”) was awful similar to what happened earlier this year on my culdesac of 6 houses. We have lived in our home in a suburb of Atlanta for 23 years and it looks nothing like the small community we moved to back then. February or March of this year the “lovely lady” two doors down at the first house on the street decided to throw a little party while her mother and grandmother (don’t know if her father is in her life?) were away at a funeral out of state. Our 17 year old daughter works and goes to school with this girl and was invited to the party. Thankfully, she isn’t into partying and declined the invitation. Instead, she went out with her boyfriend and was gone all evening. About 4 times a year this family has a get-together that typically results in cars parked 4-wide across the culdesac, loud music, my driveway being block and a call to the cops. The fine officers of our little “ville” roll in, ask them to turn the music down, inform them they are illegally parked and roll out of our “hood”. Typically, my wife and I will tolerate the party until one of the above infractions are violated (in other words, the law is broken), but this was not one of those nights. All night the music had been loud (before 10pm) and while there are a few cars parked in the culdesac (which is posted by the city as “No Parking”) the wife and I paid no attention to what we thought was another one of their quarterly family gatherings. At around 10pm the music went down and we continued to watch TV waiting for our teenager to get home. We use an app on our cellphones that can locate each member of our family that has it installed. It lets us know when one another arrive at certain predefined locations as well as their recent trips. (Big Brother is watching.) Our house is defined as a location that notifies all members when another member arrives but because of location inaccuracies we are notified when the person is on the street that runs behind our house. This gives us about a 3 minute warning as to their arrival. As I come through the garage I see my 17 year old daughter’s terrified face still in her car on the phone. I point to her, telling her to stay put, and proceed into the front yard. As I turn the corner of my house I see people running in every direction imaginable but thankfully not toward us. Once I confirm there is no threat headed in our direction and keeping my attention on the running people, I yell to my daughter to get in the house and to tell mom to call 911, shots fired. I can see the glow of cellphone screens moving through my neighbor’s yards, people running away from the house. I hear cars starting, wheels spinning and people yelling and screaming, all the while making sure there is no threat headed in our direction. Within a couple minutes I hear sirens entering the subdivision and making their way toward us. Once the police arrived they begin securing the scene and I made contact with one of the officers heading toward me. Turns out my daughter drove through the chaos of running “kids”, heard the gunshots when she turned on our street, and was on the phone to mom, terrified when I saw her in the driveway. I will never forget the look on her face and will do anything in my power to prevent it from happening to her or another loved one again. 2 girls were taken to the hospital that night for alcohol poisoning and the 18 year old girl who hosted the party was given 2 tickets and ordered to appear. No arrests. No answers. No apologies. And, uh, clean up your own yard. Broken bottles, red solo cups, trash everywhere. Here is where the similarities strike me. The lady who lives next door to me is in her 80’s and refuses to believe what happened that winter’s night, argued with me that nothing happened and felt the police were wrong in writing the party host the tickets and criminalizing yet another black kid (spoken with your inflection). She went so far as to show up to the court, chanted to free the girl and proceeded to pay her fines for her. WTF?!? Needless to say, I haven’t spoken to either neighbor since, and we are now more determined that we will not spend a 24th year in this house, city, county or state. My daughter graduates from high school in May 2018 and we intend to leave soon after. I am not living this way and I will not let my family stay in a place that is rapidly devolving into another crime infested community. 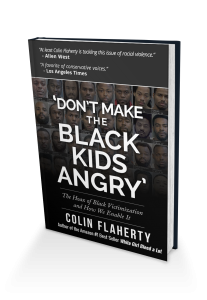 We see more and more as crime is increasing in our community that the police are less inclined to enforce the laws or make the black kids angry.